I bought some pork belly from you today at the Gig market. 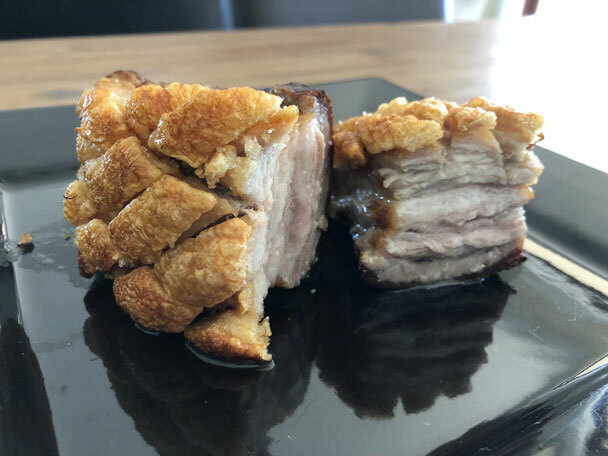 I often make pork belly for my family of 3 boys who eat as much meat as their Dad. Pork belly is definitely on the favorite dinner list. I just wanted to share with you that your pork belly was so delicious, not as fatty as others, great taste. Only one complaint, the boys wanted more and i didn't have any! We look forward to trying some more products. Last weekend we stayed in Benalla and attended one of the popular markets on the Saturday, at which we bought some of your full bacon rashers. Your bacon is the best we have found since arriving in Australia in 1966. Perfection! I coordinate the wood fired pizza oven at the Violet Town market. We have just started using GV Pork as our ham supplier. I could not be happier, the ham is shaved to perfection, it tastes amazing (like Christmas ham!) it is delivered to the market (pretty handy having them 3 stalls down from us!) And Sharon and Darren are an absolute pleasure to buy from. They have a true passion for their product and their well loved pigs too. Highly recommended! I was recently gifted some of your bacon. Such a beautiful addition to our Caesar salad tonight. So juicy and full of flavour. Well done guys. You've produced an amazing product. Great happy pork - lovely family run business. Get amongst it!